The general function of a pedometer is to count steps you take during a walk, run or jog. A pedometer can be useful in helping you reach specific exercise goals, including a daily walking goal. 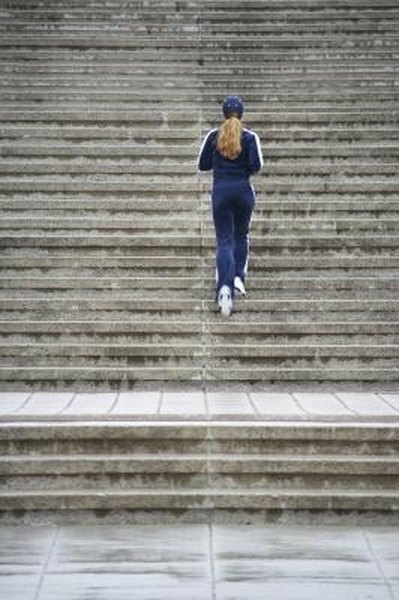 The American College of Sports Medicine classifies 10,000 steps per day as "active." It's easy to calculate how many miles per day your steps add up to. In order to get accurate readings from your pedometer, first position it correctly and then test it for accuracy. The correct way to wear a pedometer is at your waistline, in line with the middle of your kneecap. However, you can attach the pedometer at your hip if your abdomen is large. Make sure your pedometer is parallel to the ground and not tilting one way or the other or you will not get a correct step reading. After correctly positioning your pedometer, the ACSM recommends testing it using a 20-step test. To do this, set the pedometer to zero, take 20 steps at your normal pace and then check to see if the pedometer reads between 18 and 22 steps. If it does not, reposition it and repeat the test until your pedometer gives an accurate reading. To convert walking steps to miles using a manual calculation, walk one lap around a 400-meter track, counting your steps as you go. Then, multiply your total steps by 4 to arrive at a steps-per-mile calculation. As an alternative, use the odometer in your car to drive and measure out 1 mile, and then walk the mile and count your total steps. Once you know your average steps per mile, you can calculate the number of miles you walk in a day by dividing total daily steps by average steps per mile. For example, if you count 500 steps on a 400-meter track, you walk at a rate of 2,000 steps per mile. If at the end of a day your pedometer reads 10,500 steps, you walked a total of 5.2 miles. Another way to convert steps to miles is by using a step conversion chart. This can be useful to determine miles when you perform different types of activities and want to see how many miles they total. Texas Christian University provides estimates that include 2,000 steps per mile while walking or biking and 4,000 steps per mile while running, jogging or swimming. To reach the 10,000-step recommendation of the ACSM, you need to walk about five miles per day. If your pedometer shows you are not reaching this goal, the ACSM suggests that each day you try to increase the number of steps you take by 1,000, or one-half mile. However, before starting a walking exercise program, the ACSM strongly suggests that you check with your doctor, especially if you have health concerns, are over age 40 or if you are new to exercise.